It was early August of 2010, only days after a federal injunction temporarily halted the so-called "show me your papers" provision of Arizona SB-1070, the legislation that would effectively legalize racial profiling by allowing police to stop any person suspected of being undocumented, and demanding proof of citizenship.ii Reports and reactions to the law had been playing on the radio throughout the day--a sonic illustration of the human and political landscape that lay invisible as I sped through by in my car. But until the beige truck and its virulent sign appeared, it hadn't occurred to me I, too, was within the active contestation of landscape and meaning that is the borderlands. I reached for the phone to snap a picture, and noticed something strange. At the top of the screen, my carrier registered as MOVISTAR. I soon got a text message: According to my cellular company, I was in international territory. Just as it hadn't occurred to me I'd be driving through the Borderlands on my way to San Diego, I hadn't thought about how close to the actual border I would come. Out the window, the landscape was the same for miles on either side--vacant dunes tufting the surface of the earth. Turning with the freeway, I caught a glimpse of the border itself--a rust-brown fence, running less than a thousand feet away to the south, peeking out from behind the sand. With my cell phone in Mexico, my radio in Washington, and my car just past the exit to Pair a Dice Bar & Grill, I'd arrived without realizing it. I'd never been to the border before--in fact, it was my first time in the Southwest at all. I grew up and (at that point) lived far away. The border for me was a funny thing--easier to picture as a line on a map, stories in the news, and political confrontation than anything physical. Not really a landscape--continuous, historically conditioned visual cultures of place--it stood more as a representation of the abstract concepts of power and politics. In some ways, that's an accurate understanding. Traditionally a border is a piece of physical geography: a river, mountain range, canyon, or coastline. In other words, an impediment to movement that separates there from here, cultures, practices, people, and identities. But modern borders are more often political than physical, the results of wars and treaties that establish a formal division of territories whose definition lies in the temporal framework of history, the political mandate of expansionism, and the arcanely specific language of the law. Borders are diplomatic agreements, drawn on a map, and represented in line. The U.S.-Mexico border is, in part, this kind. On February 2, 1848, in Mexico City, representatives from the Republic of Mexico and the United States signed of the Treaty of Guadalupe Hidalgo. 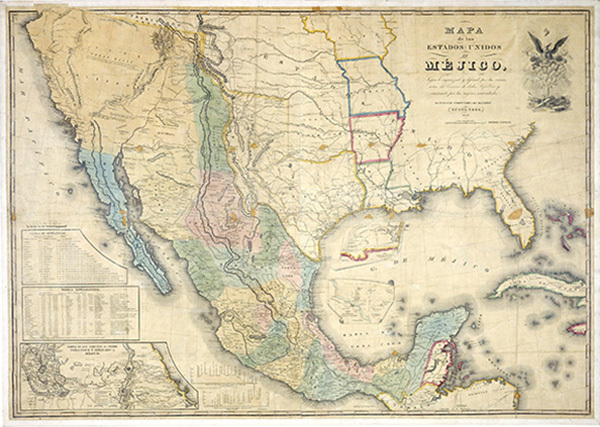 Under the terms of the treaty, Mexico ceded over half its territory to the U.S. for $15 million,iii ending the Mexican-American War, increasing U.S. landmass by 1/3, and furthering the mid-19th century project of American Manifest Destiny.iv A broad expanse of desert, ranchland, mountains, and forests, what we now know as the "American" west was at that point relatively little-known, and virtually unrepresented. 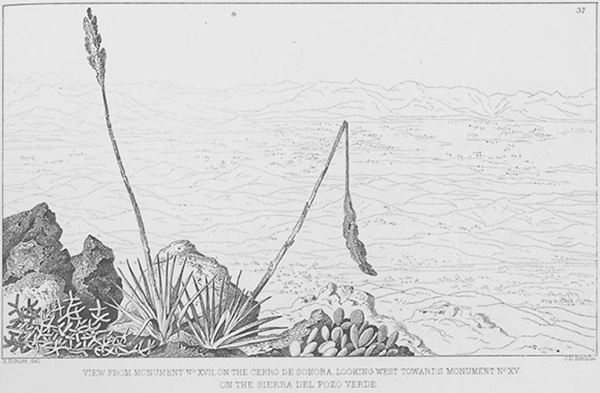 John Weyss, View from Emory's Monument South of the San Luis Springs Looking West across the Parallel of 31°20', engraved by W.H. Dougal, ca. 1856. Plate from William Emory, Report on the United States and Mexico Boundary Survey, 1857, vol. 1. Along the way, they built several masonry monuments, replaced in 1852 with rock cairns pegged with a flag--the physical instantiation of the graphic border, meant as local indexes of politics and power determined from afar. However, remote both from each other and from practical enforcement, the makers were often moved or destroyed--viewed as acts of aggression by the Native peoples who disputed both the Treaty and non-Native ownership on the whole, and as irrelevant afterthoughts by Mexican and American ranchers whose territory straddled it. Despite the Boundary Commission's effort, in effect no border existed on the ground at all. Its only record lay in the representational languages of map, text, and the occasional survey site-drawing showing something no longer there. Detail of map showing Monument 210 between Araz Junction and Holtville, California, 1891-6. From The International Boundary Commission, Report of the International Boundary Commission, United States and Mexico, 1891-6. Monument No. 210 (Iron), View to the W: On Sand Hills west of Pilot Knob [AZ], 1891-6. Plate from The International Boundary Commission, Report of the Boundary Commission upon the Survey and Re-marking of the Boundary between the United States and Mexico West of the Rio Grande. Album, 1891-1896. Arthur Schott, View from Monument No. 17 on the Cerro de Sonora, Looking West towards Monument No. 15 on the Sierra del Pozo Verde, engraved by J.D. Smillie, c. 1856. Plate from William Emory, Report on the United States and Mexico Boundary Survey, 1857, vol. 1. Arthur Schott, View towards the Eastern Slope of the Californian Cordilleras Taken from Near Carrizo Creek, engraved by W.H. Dougal, ca. 1856. Plate from William Emory, Report on the United States and Mexico Boundary Survey, 1857, vol. 1. Today it is those very perforations and first-person encounters with landscape that occupy national concern. They are the same visibilities and invisibilities that surprised me as I headed through Yuma in 2010. From mounds to monuments, maps to drawings to photographs, today's militarized border has developed a popular identity as a prohibitive barrier, even as its geopolitical function is more that of regulator of movement. As the world around it grows more difficult to comprehend in terms of the coincidence between its physicality and its influence, the way we choose to imagine the border becomes all the more simplistic.xviii Fences may mark the political line, but as in the case of the beige pickup, the radio, the cell phone, and line of sight that is the view, they are an absurd reduction of what it means to understand the politics of landscape. This summer, I repeated my drive to San Diego, two years after moving West to California, and then New Mexico. My destination, this time, was Border Field State Park, the spot on the map where the 1849 Boundary Commission began its work. 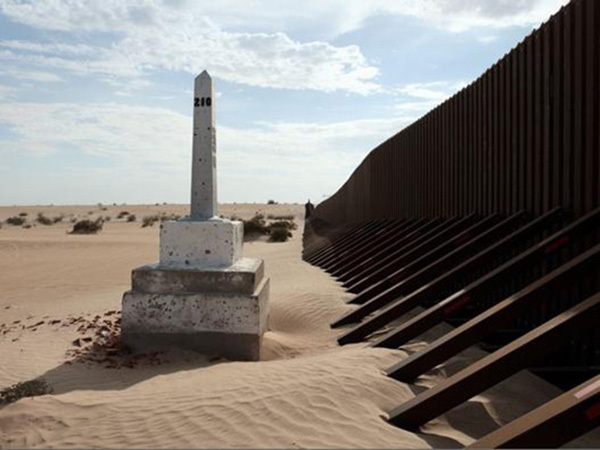 I'd wanted to find the old border monuments--many now hidden, as the photographer David Taylor's 2008-10 project Working the Line demonstrates so well, from the North behind layers of defense infrastructure. Border Field State Park offered the easiest and clearest way to see one. It's located at the mouth of the Tijuana River, in a marshy estuary south of Imperial Beach. You can't drive there on weekdays--instead you have to park a mile away and walk in, passing the observant stares of Border Patrol members on foot, on horseback, on Segway, in Jeeps, and from the helicopters buzzing incessantly overhead. You round a corner, and see the same brown fence--beyond it lies the apartment blocks and stadium of Tijuana's Terrazas neighborhood, hard up against the line. To approach the monument itself, you must speak with a Border Patrol agent, sitting in an idling Jeep just outside a high fence. You must answer some questions: what do you want to see; what is your name; where were you born. You are advised you may enter the 30' "border security zone," a fenced-in, flood-lighted area between the park and the border fence, open to the sea on its west side. You may spend 20 minutes there, and can take photos. But you cannot touch the fence--it's alarmed on the U.S. side--and you cannot stray more than 30' laterally. The monument is located behind the fence, subtracting about 3' of U.S. soil for the purposes of national security. You can just make out the carved names of Ylarregui and Weller, the text in English on the North and Spanish on the South claiming the monument as the marker of a national border. It's possible to see through to the Mexican side, where there is no fence, no border patrol, no Segways and floodlights. Instead, there's a stadium, a lighthouse, and a small plaza. During my 20-minute visit, a number of people strolled by, unconcerned. One man, bare-chested and in cutoffs, sailed through on rollerblades. He stopped to look at the monument, and then to look at me through gaps in fortified chain-link. We said hi, then he skated off, and I went back to inform my Patrolman I was ready to be released, to walk back to my car from a monument that indexed a line, conditioned a view, encapsulated a politics of national identity. i This research has benefitted from the kind advice and wisdom of colleagues whose knowledge of borders and borderlands far exceeds my own. Special thanks to Katherine Sarah Massoth of the University of Iowa, and Duane Price of the El Paso office of the International Water and Boundary Commission for their conversation and assistance in the process of writing this essay. ii On September 18, 2012 a federal judge ruled that Arizona metropolitan and state police officers could begin enforcing "show me your papers," which requires officers to demand proof of immigration papers with even the most routine civilian stop or suspicion of undocumented status. Associated Press, "Arizona: Judicial Ruling on Immigration Law," New York Times 19 September 2012. http://www.nytimes.com/2012/09/19/us/arizona-judicial-ruling-on-immigration-law.html (accessed 19 September, 2012). iii Around $388 million in 2010 currency. iv The Treaty brought the present-day states of California, Arizona, New Mexico, Utah, Nevada, Colorado, Wyoming, Oklahoma, and parts of Texas and Kansas under the jurisdiction of the United States. v Article V, Treaty of Peace, Friendship, Limits and Settlement with the Republic of Mexico (Treaty of Guadalupe Hidalgo). February 2, 1848. United States Statutes at Large 9 (1848): 922. Available at http://avalon.law.yale.edu/19th_century/guadhida.asp#art5 (accessed September 19, 2012). vii The geographer Michael Dear has written an excellent introduction to the Boundary Survey Commission's work, to which this article is greatly indebted. See Michael Dear, "Monuments, Manifest Destiny and Mexico" Prologue: The Journal of the National Archives 37:2 (Summer 2005). Available at http://www.archives.gov/publications/prologue/2005/summer/mexico-1.html. (accessed August 22, 2012). For more information on the history of the border see Paula Rebert, La Gran Línea: Mapping the United States-Mexico Boundary, 1849-1857 (Austin: University of Texas Press, 2001), and, recently, Rachel St. John, Line in the Sand: A History of the Western US-Mexico Border (Princeton: Princeton University Press, 2011). viii The Boundary Survey Commission was renamed the International Boundary Commission in 1889, and the International Water and Boundary Commission (IWBC) in 1944. The last name-change reflects, interestingly, the changing physical nature of boundaries, as shifts of tides, floods, and water flow literally redraw borders each year. Founded as an intergovernmental organization, it remains so today, under the joint jurisdiction of the U.S. State Department and Mexican Secretaría de Relaciones Exteriores, or SRE. ix Their trip would eventually be recounted in William H. Emory's 1857 Report on the United States and Mexican Boundary Survey, a three-volume report on the commission's work. Including azimuth measurements, botanical and ethnographic drawings, maps, geological studies and a memoir-travelogue, it represents the composite work of the eight-year survey project. Emory was the last of several American commissioners, following Weller, John B. Whipple, John C. Fremont, and Andrew B. Gray. Emory's report has been digitized, and is in the public domain. William H. Emory, Report on the United States and Mexican Boundary Survey Made under the Direction of the Secretary of the Interior, 3 vols., 1857. To download a free digital copy, click here. x As the art historian Rosalind Krauss has remarked, monuments mediate between site and symbolism. They are, to use the theoretical term, indexes--rooted in a particular locale, they both help furnish meaning for that place, and derive their meaning from their placement within it. For her remarks on monuments' indexicality, see Rosalind Krauss, "Sculpture in the Expanded Field," October 8 (Spring 1979): 33-44. Krauss has also written persuasively on landscape photography's various identities as art and as document. See Rosalind Krauss, "Photography's Discursive Spaces: Landscape/View," Art Journal 42:4 (Winter 1982): 311-319.
xi All 258 images were published in the International Boundary Commission's Report of the Boundary Commission upon the survey and re-marking of the boundary between the United States and Mexico west of the Rio Grande, 1891-1896. Album., 1896. The album has been digitized, and is in the public domain. To download a copy, click here. xii In the 1880s and 90s, a binational convention commissioned a re-survey of the border (known as the Barlow-Blanco Survey) for the express purpose of standardizing and anchoring these boundary monuments, and photographed them along the way. Today they number 276, thanks to several additions in urban areas over time. On the Barlow-Blanco Survey, see Joseph Richard Werne, "Redrawing the Southwestern Boundary, 1891-1896" Southwestern Historical Quarterly 104:1 (July 2000): 1-20.
xiii James C. Scott, Seeing Like a State: How Certain Schemes to Improve the Human Condition Have Failed (New Haven: Yale University Press, 1998): 82.
xv The art historian Jonathan Crary has written about the technological shaping of vision in the 19th century. See Jonathan Crary, Techniques of the Observer: On Vision and Modernity in the Nineteenth Century (Cambridge, MA: MIT Press, 1990). xvi The art historian Robin E. Kelsey has provided this definitive interpretation of Schott's work in his chapter on the artist, "Arthur Schott: Marking the Mexican Boundary" in Archive Style: Photographs and Illustrations for US Surveys, 1850-1890 (Berkeley: University of California Press, 2007): 19-72.
xviii The artist Ursula Biemann's 1999 video Performing the Border is an excellent investigation complicating this phenomenon vis-à-vis women's labor in transnational economies, exploring borderlands cultures of maquiladores in Ciudad Juarez. See Ursula Biemann, Performing the Border, 1999. Color video, 42 min.